My write up last week attempted to quell some of the qualms one might have had about cycling to work in Bengaluru. In this sequel, we discuss some of the practical aspects. Okay, I am convinced – what do I do next ? Decathlon – www.decathlon.in – Sarjapur Road – White field – Mysore Road. Bums on the Saddle – www.bumsonthesaddle.com – Jaynagar. They have recently opened a branch specialising in Specialized Cycles on Infantry road. R.R. Cycles – http://www.rrcycle.co.in/ – – This is an old cycle store with a lot of branches – in Yeswantpur, Madiwala and other locations. Cyclists for life – www.cyclistsforlife.com – Frazer town. 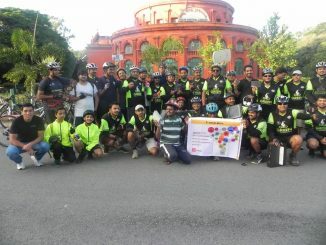 Track and Trail – www.trackandtrail.in – Numerous locations all over Bangalore. Of course this is hardly an exhaustive list. These are just some of the stores I am familiar with. One reason to buy a bike from a high end shop is that they will help fit the bike to you. This may seem a bit excessive but the fact is that when you are cycling a long distance it is important to be comfortable and not inadvertently strain some muscle. For instance the height of the seat is very important – if it is too low your thigh muscles will start aching in a short while. If it is too high you might fall when you stop. 2. Choose the kind of bike you want – there are three basic kinds of bikes – mountain bikes, hybrid bikes and road bikes. Mountain bikes typically have fat tires and small wheels and are designed for off-roading. However, often they are also good for riding in the city where the roads are not good. These can also be used for off-roading in the trails around Bangalore. Hybrid bikes, Cross bikes or Urban bikes are the bikes typically designed for commuting. They have larger, thinner wheels than mountain bikes and you sit upright. In my opinion these are the most useful bikes for urban usage as you can use them for commuting and also the occasional long ride on the outskirts of Bangalore. Road bikes – these are bikes with curved handles, used for racing. They are typically very light and have thin tyres. You can ride very fast on these bikes but you have to crouch and they are perhaps not ideal for commuting – these are more for those who enjoy competitive bike racing or go on long trips unencumbered by baggage. 3. Get some accessories. Cycling accessories, like clothing accessories, are sometimes essential and sometimes just to make you feel a little happier. Here are some of them. Helmet: One of the essential accessories for a cyclist is a helmet. If not for one, the author of this article would not be around to write it. If cycling infrastructure and roads are good then perhaps it is not so crucial, but unfortunately that is not the case in Bangalore. Pannier: A pannier is a French word for a bicycle bag – one that can be suspended or attached to the rack. This is very useful for commuters as one can carry a lot more and one’s back does not get so sweaty. Panniers can be found in various shapes and sizes – with capacities varying from a few kilos to enough to sustain you for a week of bike touring. Tools: A small toolkit – with allen hex keys and a puncture repair kit – is quite essential if you plan on cycling outside the city. Within the city there are numerous ‘pancher shaps’ where you can get punctures fixed. I also realised the hard way that there are several auto-rickshaw repair shops all over the city that have the right-sized spanners to fix cycles. Lights: Lights are essential if you plan on riding in the night. There are various kinds – for instance now one can get a `hub dynamo’ – which can power a light without making it any more strenuous – unlike the old style dynamo which, when turned on, made it harder to cycle. Specialised cycling lights can be expensive – but its easy and fun to fashion something from the cheap LED lights that one can get in any electrical shop nowadays. Tyre Liner: A very useful accessory is a tyre liner – which may save you from having to visit the numerous ‘pancher shaps.’ This is a lining that you put between the tube and the tyre to reduce the risk of puncture. Among the brands is one called `Mr. Tuffy’. It’s a little expensive, around Rs. 1000 – but well worth it. Think about it – one puncture which would force you to take an auto could easily cost around Rs. 200 not to mention the loss in time – so it pays for itself quite quickly. I have not had a puncture since I started commuting by cycle about a year ago. My colleague, who commutes a lot more, has not had a puncture since he put the tyre liner several months ago – before that he had five. Gloves: Cycle gloves are gloves which cover your palm and leave your fingers exposed. The primary purpose is to prevent severe scraping of the front of your palm if you have a fall. So they are useful though not essential. Shoes: If you plan on road biking long distances then shoes are quite useful. Cycling shoes (along with specialised pedals) snap on to the pedal so that you get additional power when you pull up – not only when you press down – so you can go much faster. They are designed to come off easily in an emergency – but can take some getting used to and you are guaranteed to have several falls before you become comfortable with them. I would not recommend them for city commuting. Lock: A lock of some sort is obviously quite useful. They come in various kinds – U-locks and cable locks being the most common. A U-lock is a heavy rigid U-shaped lock which allows you to lock your bike to a pole or some fixed object so it will not get stolen. They are usually designed so that you can lock one of the wheels as well. A cable lock, as the name suggests is a cable with a lock which gives you a little more exibility – but is arguably easier to cut. In general in India, bike theft is not so common – perhaps because cycles are considered the vehicles of the poor. But with more expensive cycles becoming common I’m sure that will change. However there is a little amount of petty theft – of things like lights – perhaps more out of curiosity than malice. Speedometer + Odometer: One can get a simple speedometer/odometer for a cycle. The way it works is you install a small magnet on the spoke of the wheel and a sensor on the fork which detects the magnet as it passes. You input your wheel size and it calculates your speed and measures the total distance you have travelled. The main purpose it serves is motivation – as you see the numbers on the odometer go up you feel more and more inspired. Also, it helps you maintain a particular speed – which is useful when riding long distances. Cycle shorts: Bicycle shorts are the tight lycra not so short shorts which make many cyclists look quite ridiculous. However they make your ride more comfortable and mitigate the damage that cycling allegedly does to male cyclists by way of affecting fertility. The way I justify purchasing any bike toy is by convincing myself that all it means is a few more weeks of cycling – since one saves around Rs. 500 a week by cycling! 4. Start slowly: Many people have not ridden cycles since childhood. And while famously it is one of those things you never forget – most people lead rather sedentary lives and suddenly starting on vigorous activity can have consequences. It is also so much fun that there is a tendency to overdo it – since you do not suffer the consequences till later. The bicycle in its crudest form, the Draisine or dandy horse, was invented by a German – Karl von Drais in 1817. This consisted of two connected wheels and was powered by running and jumping on. The bicycle in its modern form – with a chain, two wheels and ground easily accessible by the rider – was invented by an Englishman Harry John Lawson, in 1870. It was called the safety bicycle – as it was significantly easier to use than the Penny-Farthing that preceded it. It transformed the usage of bicycles from a vehicle for young men to a vehicle for everyone – and as a result played a significant role in the emancipation of women in the West. It freed up women and children to travel some distances without the need for men. Bicycle craze of the late 19th century transformed the dress styles of women – from the traditional corsets and voluminous skirts – to more comfortable clothing. The fact is that even today a cycle gives you freedom. Nowadays we no longer live in close knit societies and distances have become larger. So children are completely dependent on their parents for getting around – either to school or to their friends’ houses. If roads were safe for cycling then kids could travel around on their own and be much more free. The remarkable thing about a cycle is that it is one of the few inventions whose design has not been significantly changed in over a hundred years. Even the derailleur – the gadget that changes gears – which is only now appearing in cycles in India – was invented in 1900! While technological improvements have led to lighter materials, better lubricants, better gears and so on, there has not been any dramatic change. Perhaps because it is one of the most perfect inventions of humankind! A bicycle is quiet efficient, cheap and easy to produce and repair. It can be operated safely by virtually anyone – from a five-year-old child to a 100-year-old woman. Cycling, contrary to most modern human activities, is actually good for health. This year in Europe, bicycles have outsold cars for the first time in 70 years. This is something quite remarkable and is due to a strong movement towards popularising cycling as well as developing cycling infrastructure. However in India this has always been the case – cycles outsell cars by a 8 to 1 ratio and outsell motorcycles by a 2 to 1 ratio! Yet nothing is done towards improving cycling infrastructure. Most cities have appalling cycling infrastructure and some cities are moving to ban cycling. Kolkata has the largest number of cycling commuters in the world – yet the city has banned cycling on many roads. One has to wonder why. Perhaps the problem is that a cycle is considered a poor man’s vehicle and people aspire to move on to ‘better things’ like motorcycles or cars. One can only hope that the movements by organisations such as Praja.in and events such as Cycle Day make the people who run the city aware of the need for the development of cycling infrastructure. Netherlands is often given as the example of where the cycle in king. However, this was not always the case. In the 60s and 70s cars ruled over Netherlands and all the infrastructure was geared to cars moving faster – not unlike the signal-free roads that are being planned all over Bangalore. Then they found that the number of people being killed in car accidents was alarmingly high. In 1971, 3300 cyclists died out of which 400 were children. People were outraged and this prompted a change. In 1975, the Dutch started developing dedicated cycling routes and soon cycling shot up 70%! A few years later, only 15 children were killed in accidents in an entire year. Nowadays in cities like Groeningen 50% of trips are made by cycle and cycling has become a way of life. In Karnataka, Bijapur is the cycling capital. Many professional road cyclists come from there. The reason for this is that several years ago, the princely rulers of Bijapur encouraged cycling by hosting competitions – and to this day the tradition continues. In fact, its one of the few places in India where they are developing cycling infrastructure. Cycling is perhaps the best way to discover Bangalore. You can explore various parts – like the innards of Ulsoor or Chikpete – which are impossible to get to by other motorised means. You also get a feel of the city – you feel it in your muscles. You will quickly learn which roads are uphill and which are downhill – something you never pay attention to in a car – and it gives you a new understanding of the city. Cycling is also a wonderful way of exploring the outskirts of Bangalore. From rolling hills to picturesque lakes – it is is all really spectacular. A long cycle ride on a weekend is the best way to revitalise oneself for the week. Cycling is still the most common way of travelling between villages – so most roads joining villages are convenient and safe for cyclists. Car manufactures try to sell you cars by giving you the impression that you will be driving on open, curved roads with the wind in your hair and Princess Grace by your side. The reality is that you will probably be stuck in smoggy trac travelling at an average speed of 8km/h. If you really want to feel the wind in your hair and experience the curves of the road – get a cycle. This is Bangalore’s Cycling Moment. 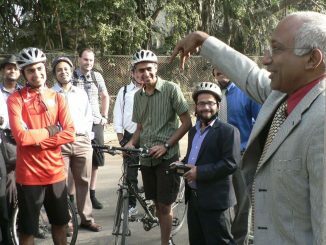 There is a lot of enthusiasm being generated by `Cycle Day’ and other such activities. We now have to make a choice about the kind of city we want to live in – one that one can walk and cycle in – or one where the car is king. The Dutch made a choice. They chose to make their streets pedestrian and cycle friendly. In the 70s the were planning to widen roads leading into the heart of Amsterdam – not unlike the signal free corridors being and road widening that’s being done in Bangalore today. But the people of Amsterdam protested. And succeeded. Is there any hope that the people of Bangalore can also have a say in their cities development – or are we just at the mercy of land grabbing developers and the tree mafia? So what are you waiting for? How can we improve the traffic situation in our city? Dear Sridhar – please read part 1 of this write up – I’ve answered the points you brought up. Is a moutain bike, pannier, glove, light etc required to cycle to work? Can the reader do this (cycle to work) with the regular BSA/Hercules cycle already at home and if his work place is 5kms away? I request the author to revisit and update this with the hesitant newbie cyclist in mind, who should not be lead to believe that all these are mandatory. The easier we may it for readers, more would join in.